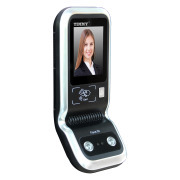 TFS 850 is our top of the line facial recognition device. It features a large 4.3" capacitive touch screen to eliminate the need for keyboards. Our new facial recognition algorithm runs on a powerful 1.5GHz quad-core processor to achieve instant verification. The TMF850 is a time attendance terminal that supports professional access control features and can be connected to access controllers that support the wiegand wiring protocol.